A benefit for Bob and Jennifer Smith and a celebration of Jayme’s return. 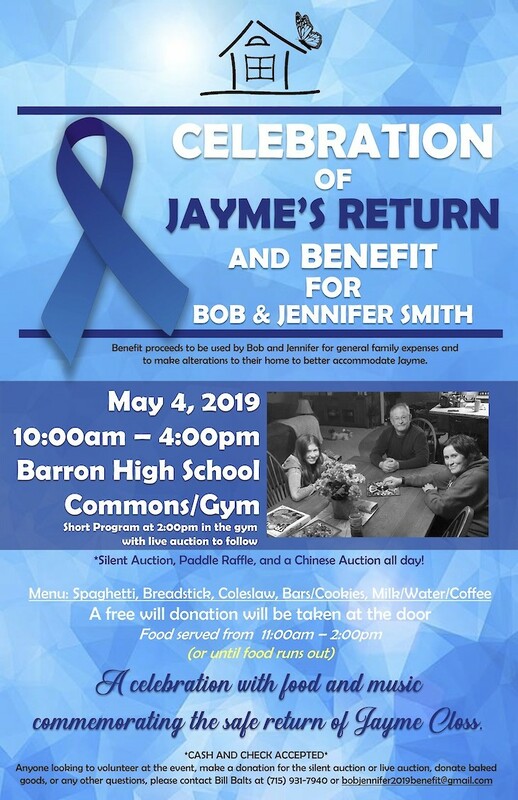 BARRON COUNTY -- Family and Friends of Bob and Jennifer Smith, and Jayme Closs are sponsoring a benefit for Bob and Jennifer Smith and a celebration of Jayme’s return on Saturday, May 4th, at the Barron High School, from 10 a.m. - 4 p.m. Food will be served from 11-2, or until food runs out. This benefit will include a spaghetti feed, and many other activities. There will be a short program at 2:00 p.m. with a live auction to follow. 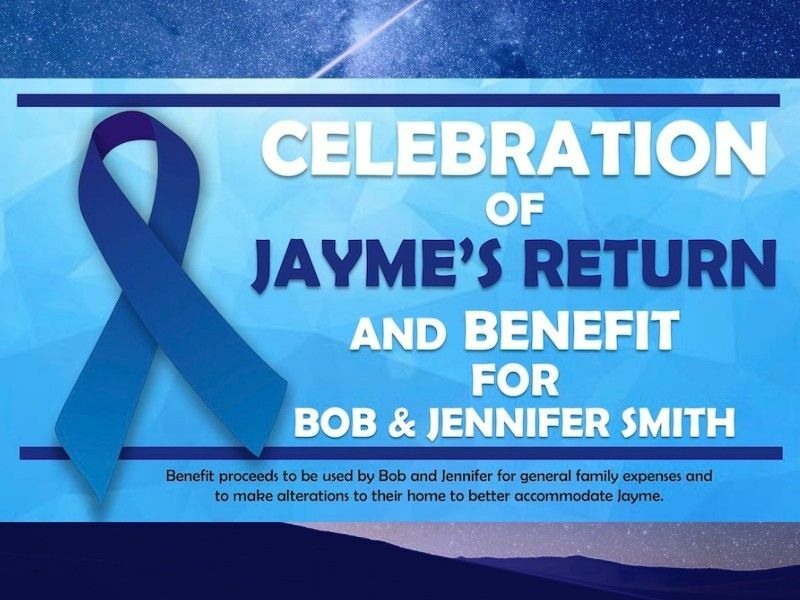 Benefit proceeds will be used by Bob and Jennifer for general family expenses and to make alterations to their home to better accommodate Jayme. A generous donation from your business would be greatly appreciated and publicly recognized. Your donation will enhance our Silent Auction, Live Auction, Chinese Auction, or P addle Raffle and aide and support Bob and Jennifer Smith, and Jayme in their time of need. If you would rather donate directly, a fund has been set up at WestConsin Credit Union in Barron, WI. If you would be interested in volunteering at the benefit please contact Bill Balts at 715-931-7940 or bobjennifer2019benefit@gmail.com. Many volunteers will be needed for the benefit and we would gladly accept your help. Lastly, if you would be willing to post a flyer highlighting our benefit for the family, we would greatly appreciate that also. Thank you so much for your time and consideration. Arrangements can be made for item donations to be picked up by calling Bill Balts at 715-931-7940 or emailing bobjennifer2019benefit@gmail.com. If you are willing to donate today, that would be great. Item donations may also be dropped off at the Barron County Sheriff’s Department in Barron, WI. We need to collect all donated items by Friday, April 26th. We are also looking for volunteers for the day of the event if you are interested. If you have any other questions, please feel free to contact us.